Picturing U.S. Foreign Policy Without Bin Laden The al-Qaida leader's killing may provide a boost to U.S. counterterrorism efforts: It could put added pressure on the Taliban, and it gets rid of "a symbol of successful defiance of the United States," analysts say. 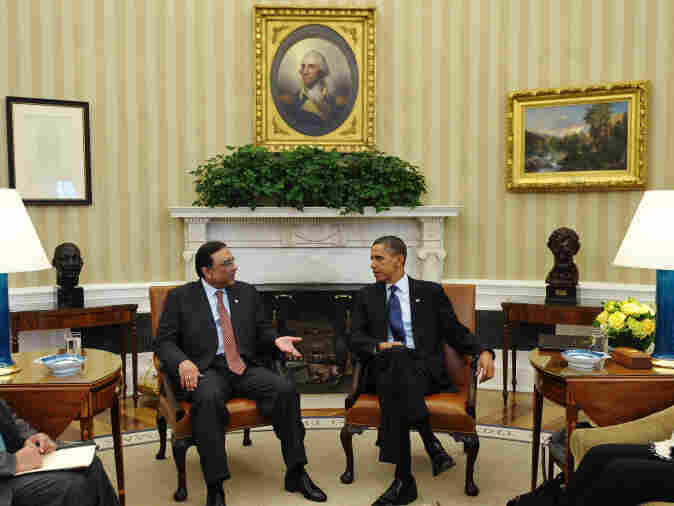 But it's also sure to prompt a reappraisal of already fraught U.S.-Pakistani relations. Pakistan President Asif Ali Zardari speaks at a meeting with President Obama in January 2010 in the Oval Office of the White House. The United States' tense relationship with Pakistan is likely to endure more strain after Osama bin Laden was killed in a compound in Pakistan. The death of Osama bin Laden is not likely to alter the basics of American foreign policy, but it may well provide added leverage for U.S. counterterrorism efforts — and it's certain to prompt a reappraisal of America's already fraught relations with Pakistan. For a decade, U.S. foreign policy has been dominated by the global war on terrorism, a threat that has become increasingly decentralized and that still exists, despite bin Laden's killing, as Secretary of State Hillary Clinton has made crystal clear. Without bin Laden, some analysts see an increased opportunity to convince the Taliban to negotiate a peace process with the Afghan government. At the same time, the killing may lead to calls for an early withdrawal of troops from Afghanistan. Sen. Harry Reid, however, says the U.S. will follow its existing timetable, with Afghan forces taking over security in 2014. Serious questions have been raised about U.S.-Pakistan relations, including Pakistan's trustworthiness as an ally. Still, a working relationship with Pakistan is considered essential. The death of bin Laden, "a symbol of successful defiance of the United States" — as Daniel Byman of the Brookings Institution puts it — may give the U.S. an image boost. "The fight continues, and we will never waver," she said. Specifically, Clinton said the United States will continue efforts to promote a peace deal in Afghanistan, something many regard as necessary before U.S. troops can complete a withdrawal slated to begin this summer. The U.S. has been pressuring the Taliban to renounce al-Qaida and negotiate with the government of Afghan President Hamid Karzai. Clinton said the message to the Taliban is the same, "but today it may have even greater resonance: You cannot wait us out. You cannot defeat us." A number of analysts believe the Taliban might well be more disposed to heed such a message with bin Laden out of the picture. The extremist Islamist movement harbored al-Qaida after forging a bond during the Afghan civil war in the 1990s. But "it was mainly a debt of gratitude to bin Laden personally, for all the assistance he offered," says Paul Pillar, a former CIA national intelligence officer for the Middle East and South Asia. Bin Laden's terrorist network has spawned independent factions in other parts of the Middle East and North Africa, but Pillar says "the Taliban wouldn't give a hoot about something like al-Qaida in the Arabian Peninsula or in the Maghreb. They only care about things going on in Afghanistan." Still, the absence of bin Laden may increase pressure for American troops to pull out of Afghanistan more quickly. It may also lead more to ask "whether the Afghan War is really the most effective way of defeating a mix of terrorist groups and threats that is nearly global in scope," writes Anthony Cordesman of the Center for Strategic and International Studies. A decade after U.S. troops invaded the remote mountainous region where the Sept. 11 terrorist attacks were hatched, 100,000 American forces remain there, conducting counterinsurgency efforts, nation-building and training Afghan troops. Polls show U.S. public support for the effort has waned. But Senate Majority Leader Harry Reid says the U.S. is sticking with its timetable: a partial withdrawal to begin in July, and Afghan forces slated to take over security in 2014. President Obama, likewise, has said nothing to suggest he's rethinking this. Though Richard Haass, of the Council on Foreign Relations, suggests that "if Obama does want to change course in Afghanistan, he may be able to sell it a little more easily" with bin Laden gone. The biggest foreign policy fallout will no doubt be in the United States' complicated and tense relationship with Pakistan. To the surprise of many, bin Laden was not in a remote mountain cave near the Afghan border, as the public had long believed. Instead, he had been hiding in a custom-built, well-secured compound in a city a short drive from Islamabad. "It strains credulity to think some Pakistani officials did not know what was going on," says Haass. The man who created the al-Qaida terrorist network that killed 3,000 people in the attacks of Sept. 11, 2001, is dead. PAKISTAN: Did Military Know Whereabouts? He predicts "another moment of truth," like that shortly after the Sept. 11 attacks, as the U.S. gauges once again whether Pakistan can be counted as a trustworthy counterterrorism ally. Pakistan's high commissioner to Britain says his country worked with the United States to hunt down bin Laden, calling it a "joint operation, secretly collaborated, professionally carried out and satisfactorily ended." But Haass says it is telling that the U.S. acted unilaterally in the end, storming bin Laden's compound without alerting Pakistani officials beforehand. Given the latest revelations of mistrust, he says it could be hard to continue justifying the generous flow of American aid money to Pakistan. On the other hand, analysts say a continued working relationship is essential. Mike Rogers, chair of the U.S. House Intelligence Committee, estimates that "of the 20 senior leaders in al-Qaida, at least a dozen of them we believe to be traveling around Pakistan someplace." The United States could leverage this week's events. Retired CIA veteran Paul Pillar believes Obama has done well to not publicly embarrass the Pakistanis. "But privately," he says, "[Obama] could basically say, 'You owe us one now.' "
Gideon Rose, of the Council on Foreign Relations, also wonders about the precedent of the dramatic raid, and how it could affect future counterterrorism operations in Pakistan and elsewhere. "The American public will want to see this kind of thing being done," Rose says, "whenever and wherever there are threats to American national security that can be eliminated this way." The American public will want to see this kind of thing being done whenever and wherever there are threats to American national security that can be eliminated this way. Foreign policy, of course, is inextricably linked to the projection of image and power, and in that sense bin Laden's death could prove immensely valuable for the U.S.
"Every day bin Laden survived, he was a symbol of successful defiance of the United States," says Daniel Byman of the Brookings Institution. Nicholas Kristof of The New York Times writes that extremist groups were long encouraged by that defiance. In fact, he writes, "Bin Laden himself once said that people bet on the strong horse." But now, "the killing underscores that the United States is the horse to bet on." Haass, of the Council on Foreign Relations, wonders if current or would-be terrorists may now be dissuaded, though he is quick to add that the terrorism threat certainly remains, and may even be heightened in the wake of the killing. But bin Laden's death also comes as his own image has waned, his power diffused and his iconic brand marginalized. "The Arab Spring really hurt its narrative," says Byman of Brookings, referring to the mass protests and revolutions that have gripped the Middle East and North Africa in recent months, with nary a poster or chant referencing bin Laden or al-Qaida. "It showed that peaceful change was more successful than violence, and that was a tremendous blow."